Big GPS receiver with fast auto-routing and route optimization, voice guidance, color display with touchscreen, infrared remote control, integrated world and Europe/Africa map, pre-installed detailed map of Europe plus USB interface, slot for SD memory card and MP3 player. Traffic receiver available as an option. Well suited for all kinds of vehicles, particularly for larger cars such as trucks and motorhomes. 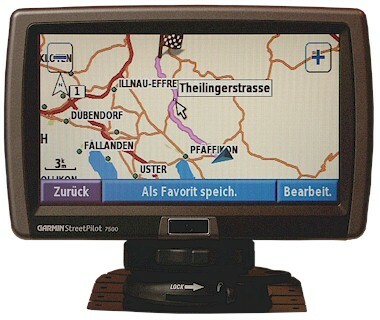 The GARMIN StreetPilot 7500 provides fast automatic route calculation and optimization by reordering routes with multiple via-points, visual and voice guidance, has a large, easy to read color display with touchscreen, a very sensitive antenna, an integrated world map (overview) plus a base map of Europe, Africa and the near East. It has a multi-lingual user interface and is easy to use, either via the touchscreen or the infrared remote control. The StreetPilot 7500 has 1.92 GB built-in memory, the pre-installed, detailed maps of all of Europe with even more information, such as local roads, restaurants and points of interest occupy approximately 1.29 GB. The unused memory is available to store additional detailed maps, waypoints and MP3 files. A DVD City Navigator Europe NT+ plus a free unlock code is also included. In addition, it is equipped with a speech computer to announce the names of the roads and to read audible books. The StreetPilot 7500 has an audio output to connect either a headphone or an external sound equipment and it has an audio and video input to play music, images and videos. Finally, the StreetPilot 7500 has a slot for an optional SD memory module to store additional detailed maps or data such as MP3 files and it supports an optional TMC receiver to incorporate traffic news. It provides navigation information outdoors, in a car, in a train or even in an airplane (see MapSource examples). 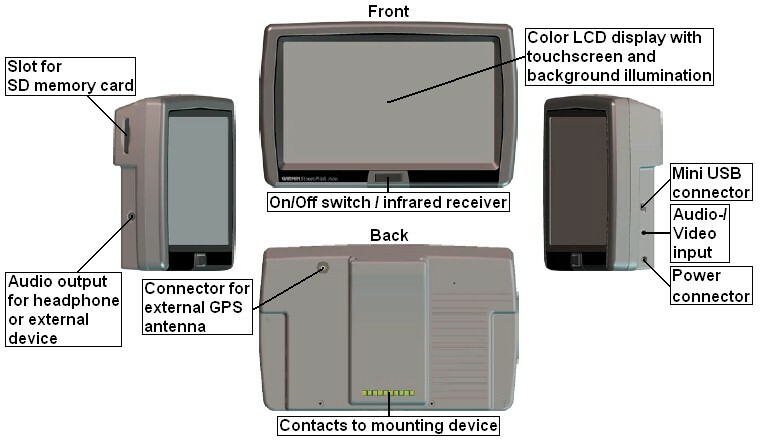 Integrated 12 channel receiver with very sensitive built-in GPS antenna, connector for external GPS antenna (external antenna available as an option). User interface in 23 languages: Croatian, Czech, Danish, Dutch, English (American and British), Estonian, Finnish, French, German, Greek, Hungarian, Italian, Lithuanian, Norwegian, Polish, Portuguese, Romanian, Slovakian, Slovenian, Spanish, Swedish and Turkish. Voice prompting in 30 languages: Bulgarian, Croatian, Czech, Danish, Dutch, English (American, Australian and British), Estonian, Finnish, Flemish, French (Canadian and European), German, Greek, Hungarian, Italian, Lithuanian, Norwegian, Polish, Portuguese (Brazilian and European), Russian, Serbian, Slovak, Slovenian, Spanish (American and European), Swedish and Turkish. 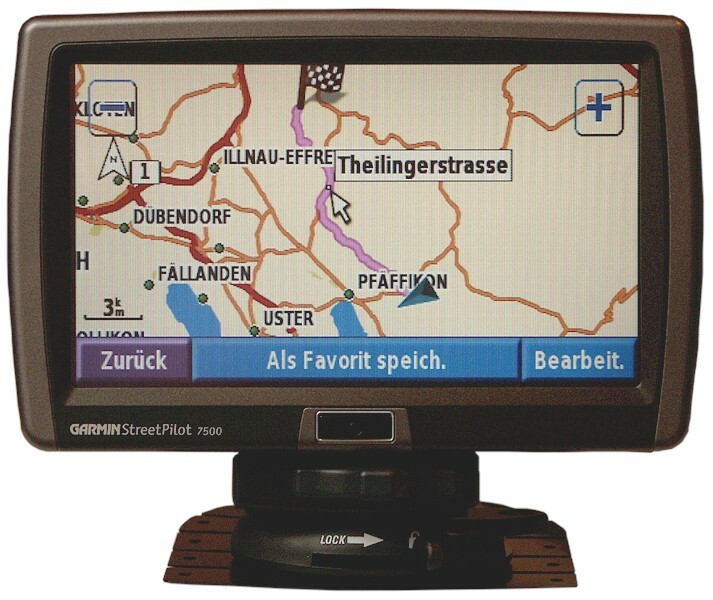 Built-in memory with pre-installed detailed map of Europe (City Navigator Europe NT+) with local roads, addresses and points of interest plus slot for SecureDigital memory card (SD memory cards available as options). Routing speed: 8.76 (see GPS Routing Speed for details). MP3 player, listen to your favorite music or audio book while you are travelling. Audio output to connect either a headphone or an external sound equipment. Audio and video input to play music, display images and to show videos. Suited to be used in any kind of vehicles. Comes with power cable and mounting kit with shutter for quick mounting and dismounting to easily remove the GPS receiver (seamless switching between cars, theft protection etc.). Large, illuminated, easy to read LCD display with automatic backlight adjustment, dimension: 155x87 mm (7"), resolution: 480x234 pixels. Easy to operate via touchscreen or infrared remote control. Powered by an external 12 V power source, such as a car's cigarette lighter or a connector. One power cord with a plug for cigarette lighter plus one power cord with open ends are included. In addition, a power supply for an outlet with 110/220 V is included. Finds routes almost 9 times faster than the GARMIN StreetPilot III, see GPS Routing Speed for more information. Extended search function for points of interest, addresses and intersections, if there is a MapSource map available in memory. The StreetPilot 7500 comes with pre-loaded detailed maps of all of Europe plus an unlock code. If you buy additional maps, you have to request an unlock code from GARMIN via Internet. A Windows PC is required to transfer maps to the GPS device. Stores up to 2000 waypoints with name (up to 20 characters) and icon (choice of 80 symbols). The product MapSource City Navigator NT+ Europe is very similar to MapSource City Navigator Europe except for the fact, that the data is much more compressed and therefore requires less memory on the GPS device. Only GPS devices which can handle the compressed data support NT+ maps. Here you can find more information about MapSource City Navigator Europe. GARMIN StreetPilot 7500: This model has been discontinued; however, you can still order options for the StreetPilot 7500. All options for the models of the GARMIN StreetPilot 7500 in detail, find maps here. Note: The size of the images below has been reduced. Search for banks, gas stations, hotels, restaurants, shopping malls etc. The StreetPilot 7500 appears as an additional drive on the computer to transfer MP3 files.